As a reconstituted potato based snack, these were not snappy or crisp like a Potato Crisp. They were however crunchy, but in a muted sounding munch fashion that quickly turned pulpy after a couple of firm bites. These snacks are very easy to describe. They are circular in shape. They were mostly gently bent, so not completely flat. The surface was bumpy but smooth. The colour was a medium orange, which represented the copious powdery seasoning. A Nose Plunge Test revealed a rather strong and imposing aroma. It was a sort of tomatoey, paprika sweetness that hinted towards generic Prawn Cocktail Crisps flavouring. The taste was similar, but there was a striking sweetness. 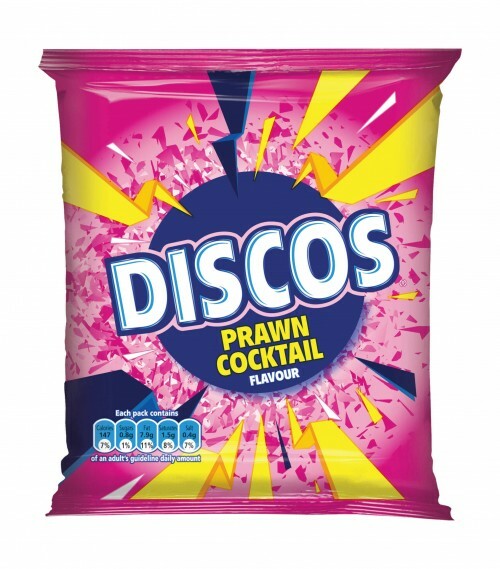 It was a strong version of standard Prawn Cocktail flavouring, which of course tastes little like Prawn Cocktail sauce, but is random enough to be likened to other flavours of this type.